Propane grills come in multiple configurations for convenient burner access, more high-heat capabilities, and extra comfort features also. In the main part of our article, we will list the physical characteristics of seven propane units, followed by a short review for each product that will highlight the features of the grill and each review includes Pros and Cons. Total cooking space: 276 sq. in. The Pit Boss Grills 75275 stainless steel gas grill sports a rugged 100% stainless steel construction, is lightweight, portable and built to last. It makes for an outstanding travel grill, with its four folding legs, lid latch, and low weight (just 15 lbs). This propane grill has all the functions and perks of a full-sized gas grill, such as a generous cooking space, at an excellent travel size. It can easily be used with a folding stand (we recommend this one by Cusinart). You can also use it as a tabletop thanks to its folding legs. This Pit Boss comes with a connector for a large gas propane but you can buy an adapter for an 1-lb propane tank here. A smaller tank is more convenient for fast set-ups and there is no longer the need for you to lug around a 20-pound gas tank. This grill is one of the sturdiest portable gas grills we have ever reviewed and, for what it has to offer, the price point is hard to beat. 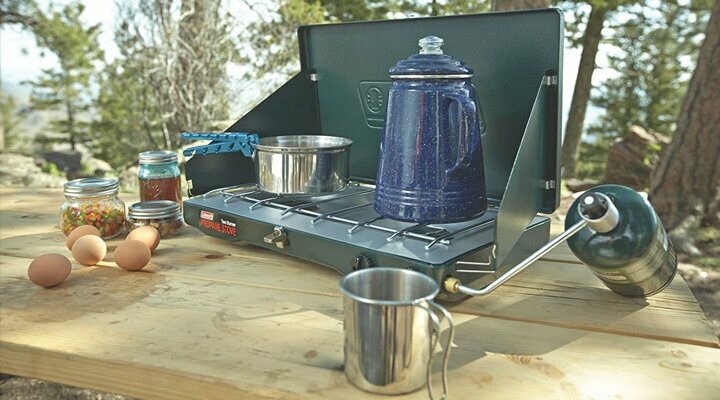 The US PIEDLE Portable 2-Burner camping propane grill comes with a practical camp stove that can be used at the same time. This very practical camping grill sports a heavy-duty construction, with a sleek but corrosion resistant red and black powder coat finish. The whole grill can be easily folded up and can be moved around thanks to a carrying handle and a reliable lid latch. It should fit in most car trunks. The The US PIEDLE Portable 2-in-1 propane grill and stove is perfect for couples that are into tailgating, RVs, camping, hunting and fishing trips. The Char-Broil Classic is an affordable 3-burner gas grill for a large family or group. It can cook for up to 6 (hungry) adults at once. You can get the 2-burner version, but if you are into grilling veggies and meat at the same time or like having friends over, this 3-burner model is the right pick. The grill comes with 2 wheels and at 48.5 lbs, it is lightweight enough to be moved around by a single person. It also had a warming rack and two metal side shelves for extra food preparation space. This propane gas grill lacks the bells and whistles of a similar big box store grill but it has all the basic functions, and the price is unbeatable. The Smoke Hollow 205 is a quality stainless steel tabletop propane gas grill that comes with a generous warming rack and a practical smoke tray. The tray’s 3500 BTU burner can reach temperatures up to 600˚ F. You can add wood chips to the provided wood chip pan to add that nice flavor only a charcoal grill could replicate. Another great thing about this grill is that the main grill surface is made of porcelain-coated wire cooking grids. The classic wire grill construction is perfect for easy cleaning as burnt sauces and food scraps no longer require an eternity to be scrubbed off, as opposed to the cooking surfaces that sport a flat metal surface with slots instead or wires. For $40 less, you can get the Smoke Hollow propane grill model with no smoke tray. For really small spaces such as tiny patios, decks, or kitchens, we recommend the Cuisinart CGG-180T Petit Gourmet tabletop. While it is compact and small enough to be stored away in a closet, the grill’s cooking surface is large enough to cook a hearty meal for a family of 4. It is a good quality small grill, that heats up lightning fast (if the top closed) and cooks surprisingly even. The best part is that the Petit Gourmet is very portable. At just 2.2 lbs. and with a briefcase-style handle and practical lid latch, this grill can be folded up and safely carried around or stored in a small space. The Petit Gourmet is also incredibly easy to clean as the grill and drip tray are both dishwasher safe. It is perfect for family tailgating, small patios, boats, and RVs. The Camp Chef Tahoe Deluxe grill is a sturdy and well-built propane grill that was designed for big cooking tasks such as summer canning, group camping, tailgate parties, backyard BBQ and more. It is easy to set up – the 30” long legs require less than a minute – and can be used both as a freestanding gas grill or a tabletop. With this grill, you won’t have to worry about cooking for a large group or family on a small camping stove. The Camp Chef Tahoe Deluxe grill can double as a backyard stove and we highly recommend it to summer time cooking fans. By Camp Chef, we also highly recommend their awesome outdoor pizza maker, the Camp Chef Italia Artisan Pizza Oven, in which you can get perfectly baked pizzas in less than 5 minutes. The Coleman stove has endured the test of time since its WWII debut. This unit is highly portable, allowing it to be carried anywhere. Each of the two burners is adjustable. The grate is easily removed to provide a quick cleanup. Users can use either a 12-inch or a 10-inch cooking pan. In fact, they have enough cooking surface to use both pans for a faster process. With propane grills, money will purchase the extra burners and extra cooking real estate required by today’s backyard chefs. Have you found your best propane grill yet? Please comment below and let us know which model recommend or which entry caught your eye in this list! I do a lot of camping and I’m always looking at propane grills as a result. I’ve owned several over the last few years. Most are fairly similar, but you’ve managed to put together a really good list here. Any would be a good starting point. Hey, Kathryn, thank you for your feedback! We invite you to follow our Barbecue Grills Expert Facebook page as well to find products for all sorts of similar activities.